The team is currently ranked 14th on the HSBC Standings log with four points and will kick off their campaign on 26th January at 0022Hrs against South Africa.Three hours later they’ll meet Scotland for the second time this season at 0348Hrs before ending their day one at 0800Hrs against France. Former Kenya Under 19 Captain, Harold Anduvate is also part of the team on National Duty. 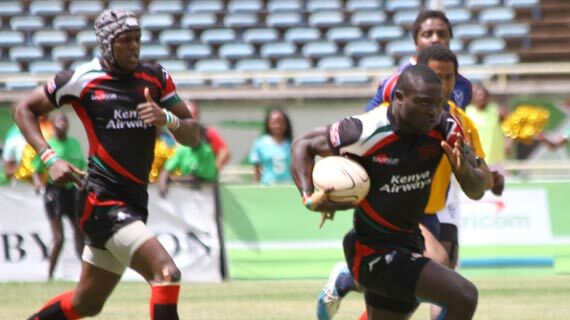 He is one of five new call ups into the squad: Brian Wandera, Eliakim Kichoi both who were in the Safari7s squad while Eliakim was also part of the team that traveled to Tunisia for the Africa Men’s 7s. William Reeve has also received a nod from the Head Coach. They are joined by Cyprian Kuto, Johnstone Olindi, Brian Wahinya, Vincent Onyala and Daniel Taabu all who were in the Dubai and CapeTown 7s legs of the HSBC World Sevens Series. While naming his squad, head coach Paul Murunga is confident that based on the training sessions the team has had, they will improve on their performance as the HSBC Caravan heads to New Zealand. Charles Omondi and Alvin Otieno miss out on the tournament due to injuries. Mark Wandetto travels as player thirteen. Jacob Ojee – ©(KCB) Michael Wanjala – Vice Captain (Menengai Cream Homeboyz),Cyprian Kuto(Menengai Cream Homeboyz), Vincent Onyala(KCB), Brian Wahinya(Blakblad), Brian Wandera(Menengai Cream Homeboyz), Daniel Taabu(Stanbic Mwamba), Johnstone Olindi(Menengai Cream Homeboyz), Bush Mwale(Menengai Cream Homeboyz), William Reeve(Kenya Harlequins), Eliakim Kichoi(Stanbic Mwamba), Harold Anduvate(Menengai Oilers), Mark Wandetto(Menengai Cream Homeboyz).